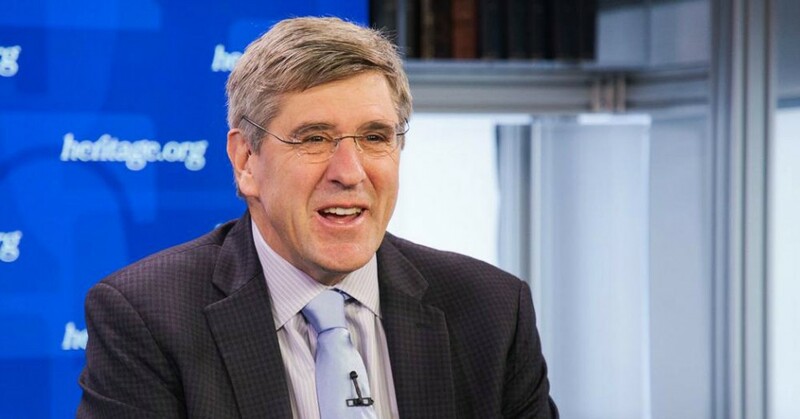 Economists and progressive experts responded with exasperation and unease on Friday after President Donald Trump said he will nominate right-wing commentator Stephen Moore to the Federal Reserve, the gatekeeper of the nation’s economy. While it was a bold and blatantly political move, Trump’s nomination of Moore didn’t seem to shock some who have observed the president’s tendency to surround himself with sycophants. “Moore’s direct criticism of Powell surely scored points with Trump,” said Capital Alpha Partners, a Washington strategic research firm, in a report Friday. Editors’ note: Stephen Moore was also one of the people behind the ads linking Bill Ayres to Obama during the 2008 campaign. His partner was somebody who was in the news quite a bit recently; a long time Republican operative named Paul Erickson, whose girlfriend, Maria Butina, pleaded guilty to charges of being a Russian agent. Small world, eh? This entry was posted in Banking & Lending Issues, Corporate Personhood, Corruption, Economics, Government and tagged #GOPTaxScam, Capitalism, Center on Budget and Policy Priorities, Chye-Ching Huang, Common Cause, Corruption, Donald Trump, Economics, Federal Reserve, Heritage Foundation, Jared Bernstein, Kansas, Koch brothers, Paul Krugman, Sam Brownback, Stephen Moore, taxes on March 23, 2019 by ew.